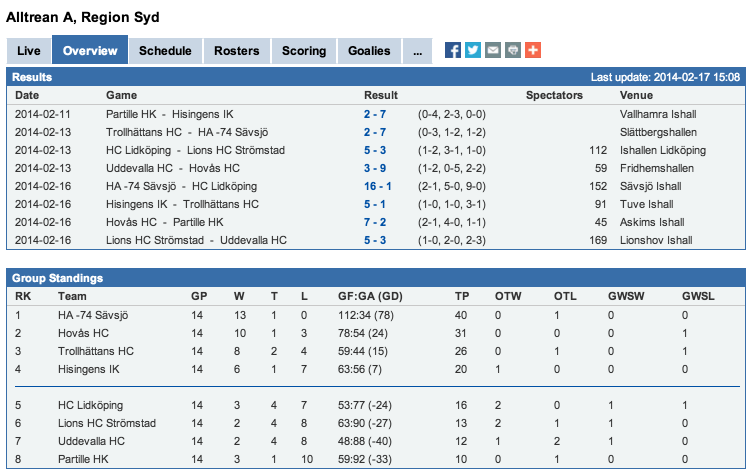 My first season here in Sweden, playing for Lions HC Strömstad, has come to an end. Our team finished just out of the playoff round in the higher series, by finishing in 6th place, needing 4th or better to move on to the playoffs. Our team finished with an overall record of "Team Record: 13-10-0-1 (0565) Pts For 133, Against 124". 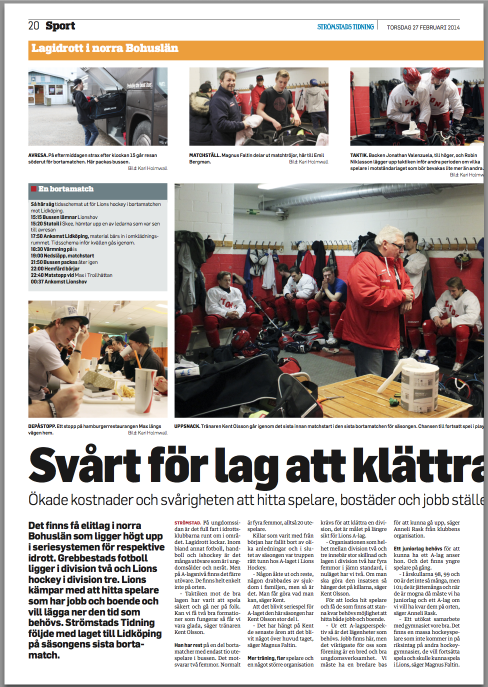 As part of our last road trip to Lidköping, a local reporter followed us on the road to report on how the season went (seen below). Although I'm not too sure what most of it says, it was nice to see it debute in the local paper, on the front page. What have I learned, you ask? 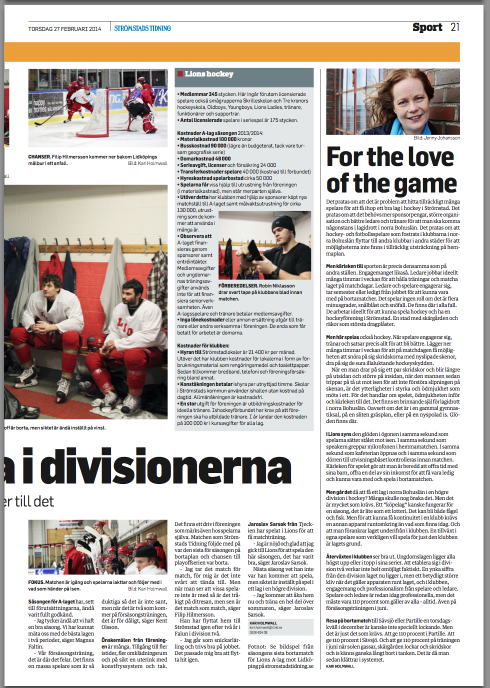 - People here in Sweden love hockey. It's not uncommon for every single person in our small town to have played hockey, been apart of the club in some way, are currently a sponsor of the club, or are part of Lions Hockey Alumni (a.k.a. The Old Boys). - I've learned that every Friday and Saturday most people in town go out to the local pubs (well I should say the one Pub, a.k.a The Dubliner) and drink until they can hardly stand - which must be that viking blood in them. I guess it's normal to drink at home with friends until about 12 midnight, then stumble down to the Pub for the next 3-4 hours and drink there. You won't go out to town and not see at least one teammate, or someone you know, which are just the perks of being in a small town. - Sweds love their cross country skiing - who would have known? - Sweden is the "2nd Happiest Country in the World", behind Denmark. I'm not sure if this is becasue everyone is so family orientated, but most people are always happy and never too down on life. People here are beyond down to Earth, and you find very few fake people; everyone is raised to be very genuine. - People ALL over Sweden can actually speak very good English - not just fluently, but very clear, and easy to understand. This was one of the main things that suprised Michaela and I. - There are no polar bears in Sweden (sad face), but there are bears, swans, moose (meese? mooses? moose? whatever the plural is) and other forest type wild life. - If you visit or move to Sweden, you will be invited to a "dinner party." It's inevitable and there's no getting around it! Dinner parties generally serve very delicious traditional food, like lye soaked cod, moose meatballs, lingonberries, and so on. Make sure you dress up, otherwise you will definitely feel under dressed when you arrive. - Sweds and Norwegians have a definite love-hate relationship, a lot like USA and Canada, but we all know which countries are better..